Tropical tree and lianas in the understory are limited by soil nutrients despite growing in extremely low light. It is not known if nomadic vines are also limited by nutrients in low light conditions. 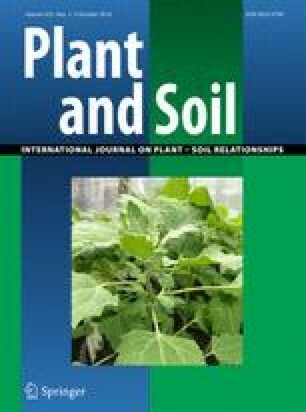 We measured differences in root architecture and mycorrhizal colonization, and leaf nutrients of a nomadic vine, Philodendron fragrantissimum (Araceae), in nitrogen (N) and phosphorus (P) fertilization plots in a lowland tropical moist forest in central Panama to measure potential nutrient limitation. Relative to plants in control plots, leaf P concentration was 54% higher and leaf N concentration was 10% higher for plants in the P- and N-addition treatments, respectively. The N:P of leaves suggested P-limitation in the N-addition treatment and the control but not in the P-addition treatment. Root branching was highest in the P-addition treatment, and P-addition reduced mycorrhizal colonization. The large effect of P fertilization suggests that, like many tropical plants, P. fragrantissimum has the potential to be P-limited. Although further study is needed, we suggest that nomadic vines be added to the growth forms that respond to nutrient addition in the forest understory and conclude that nutrient-limitation seems like the rule rather than the exception in the light-limited understory. The authors thank Mark Wagner for field support and data collection; Christina Wells for the use of her lab to conduct root mycorrhizal analyses as well as use of the WinRhizo program; and the Smithsonian Tropical Research Institute and Barro Colorado Island for logistical support. We thank G. Zotz and an anonymous reviewer for helpful comments and edits on previous versions of our manuscript. Funding for this research was provided by Clemson University and a Wade T. Batson award for field botany to CLW. Financial support for the Gigante Fertilization Project is provided by grants from the Andrew W. Mellon Foundation and the Smithsonian Scholarly Studies program.